NETWORK FINALS: ABC’s TRUTH & LIES special and NBC’s rerun of CHICAGO FIRE fell 0.1 in final numbers. CABLE HIGHLIGHTS: THURSDAY NIGHT FOOTBALL didn’t have a broadcast simulcast this week, giving NFL Network control of the night, with the game at 3.05 and various pre- and post-game programming in the next 4 slots. Lifetime’s PROJECT RUNWAY rose 0.06 to 0.46. On History, MOUNTAIN MEN jumped 0.13 to 0.42, and ICE ROAD TRUCKERS was up 0.05 to 0.28. 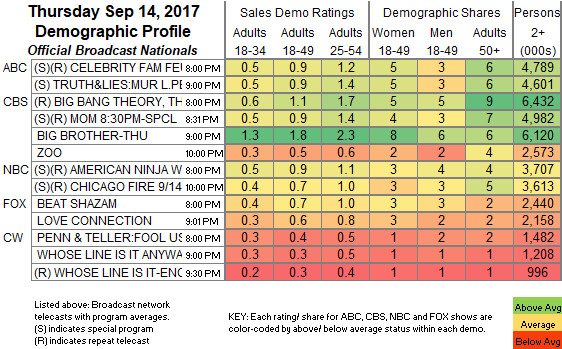 Tru’s IMPRACTICAL JOKERS returned at 0.42, and the AFTER-PARTY was at 0.22. MSNBC’s RACHEL MADDOW SHOW easily topped cable news at 0.35/2.9M, above Fox News’s THE FIVE at 0.27/2.4M, and CNN’s ANDERSON COOPER 360 at 0.24/1.1M. TBS’s THE GUEST BOOK dipped 0.02 to 0.35. ESPN’s COLLEGE FOOTBALL game was at 0.34. On Bravo, FLIPPING OUT held at 0.34, and GIRLFRIENDS GUIDE TO DIVORCE was up 0.02 to 0.15. On HGTV, DESERT FLIPPERS gained 0.05 to 0.30, FLIP OR FLOP ticked up to 0.30, HOUSE HUNTERS climbed 0.03 to 0.29, and HOUSE HUNTERS INTLwas up 0.03 to 0.28. On ID, GUILTY RICH grew by 0.03 to 0.27, and KISS OF DEATH was up 0.02 to 0.26. We’s GROWING UP HIP-HOP edged up 0.02 to 0.26. 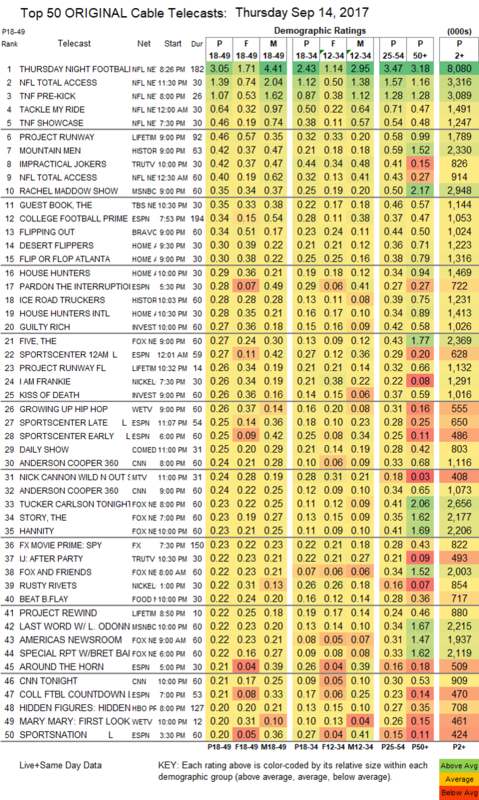 MTV’s WILD N OUT ticked up to 0.24. Food Network’s BEAT BOBBY FLAY fell 0.04 to 0.22, and THE ZIMMERN LIST premiered at 0.17/0.14. FX’s BETTER THINGS returned at 0.17, down 0.14 from the 2016 series premiere. CMT’s DALLAS COWBOY CHEERLEADERS held at 0.10. POP’s IMPACT WRESTLING remained at 0.05.